Everybody needs at least one MIDI controller. We’re at a point where we can use almost anything to reach into our DAW and boss it about, from a citrus fruit (true), to a phone or a master keyboard with hammer-weighted keys. 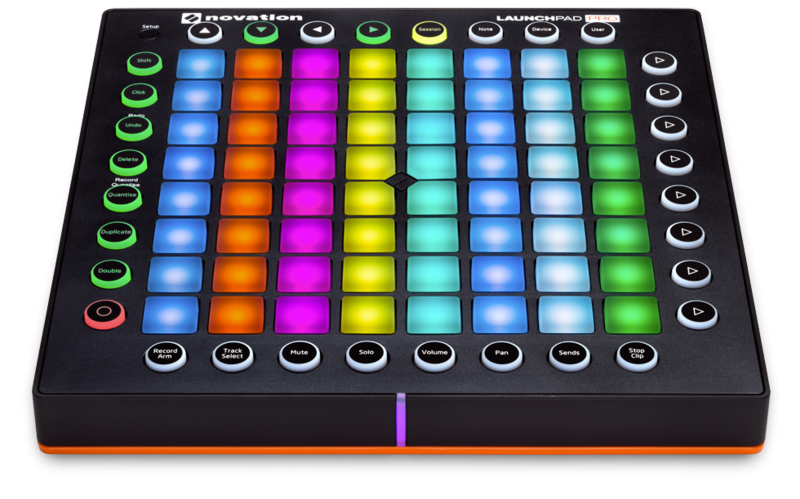 In recent years, though, the popularity of Ableton Live, with its distinctive Session View grid, has driven the rise of pad-based controllers, and Novation’s Launchpad has been there from the beginning. The latest incarnation is the Launchpad Pro, which caused a stir at the NAMM Show earlier this year, and is now ready to take its place at the top of the Launch tree, above the Launchpad S and Launchpad Mini. The Pro is a tad larger than the regular Launchpad, but it’s not hefty. The pads are the same size as on previous generations, and everything feels solid – I’ve never experienced build-quality issues with Novation products. 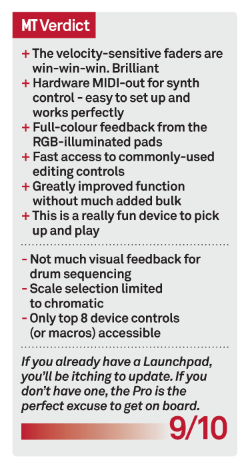 There’s plenty of newness to be explored, with velocity-sensitive full-colour RGB pads, hardware MIDI, mains power and an array of edit buttons; that’s at least two items ticked off my personal wish list. Connections include a USB port, minijacks for MIDI in/out, and mains power (with on/off switch). In the box, you’ll find a USB cable, power supply, two minijack MIDI cables, a quick start guide, download info and serials for Ableton Live 9 Lite, Loopmasters sample content, and Novation’s Bass Station and V Station AU/VST plug-ins. I connected the Pro via USB, plugged in the mains supply and launched Live 9 – the unit quickly appeared as a control surface in MIDI Preferences. I opened an existing set, containing a few hundred clips arranged over 480 scenes, and began to enjoy the benefit of the update to full RGB colour LEDs; clip launching with the Pro is an improved experience when it’s showing clip colours. Navigation of large sets is achieved by pressing and holding the Session button and scene launching is done via the right-hand buttons. That’s all good enough in itself, but there’s more, as a press of the Note button transforms the Pro into a grid-based keyboard, with velocity sensitivity and aftertouch, defaulting to C major, starting with C1 at the bottom left. The root notes are lit pink, and other notes in the scale are blue; all other notes are unlit but still playable. Some extra scale choices would be nice, but a simple chromatic keyboard layout is totally playable as it is. I’m sure we’ll see further developments on the scale front, maybe from Novation, or the active user community that will undoubtedly embrace the Pro; until then, if you want to be ‘locked’ into a scale, use Live’s Scale MIDI effect device. The Pro is small enough to put on your knee and jam with; it’s very playable – I’d suggest that these modestly-proportioned pads are the ideal size for finger-style grid performance. Load a typical Live Drum Rack, enter Drum mode, and see the trademark 16 yellow pads at the bottom-left. Continue adding drum sounds, and the entire grid will be populated, accessing up to 64 drum pads simultaneously, and you can scroll through another 64 if you have a monster drum kit. You won’t be drawing in beats sequencer-style, but the Pro’s buttons give you everything you need to create a clip, and record quantised beats, mouse-free. If I was working with drums all day every day, truthfully the Pro wouldn’t be my go-to box, but for on-the-move beat making it works great. It’s time to mention my absolute favourite feature. Any time you’re dealing with a fader function, you can tap a pad to change the value for that fader. This is not new. But what is new is that you can tap a pad, and the parameter value will ‘slide’ to that position, illuminating the pads between the two points – it’s a smart way to overcome the low-res effect of changing controller values with only eight steps. Tap across a number of faders at once, and watch and listen as they all move to their new positions – this creates very organic changes to your sound. Not enough? These fades are velocity-sensitive – tap a pad gently and the fader value slowly moves to the new position; tap harder and it moves faster. 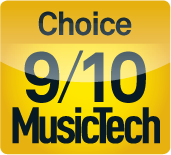 1: Setup Button – Press this button to view the Setup page and configure settings, including layout selection, MIDI routing and channels, velocity sensitivity, and aftertouch. It’s especially useful for non-Ableton Live applications, such as other DAWs and connected hardware. 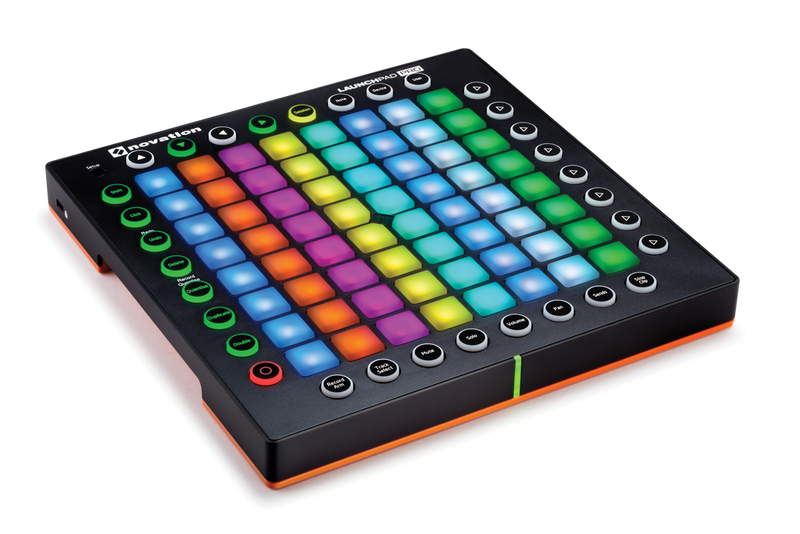 2:Mode buttons – Quickly swap the Launchpad Pro between clip and scene launching modes, note input for instruments or drums, parameter control for audio and MIDI effects or instruments, and into User mode, for a fully customisable environment. 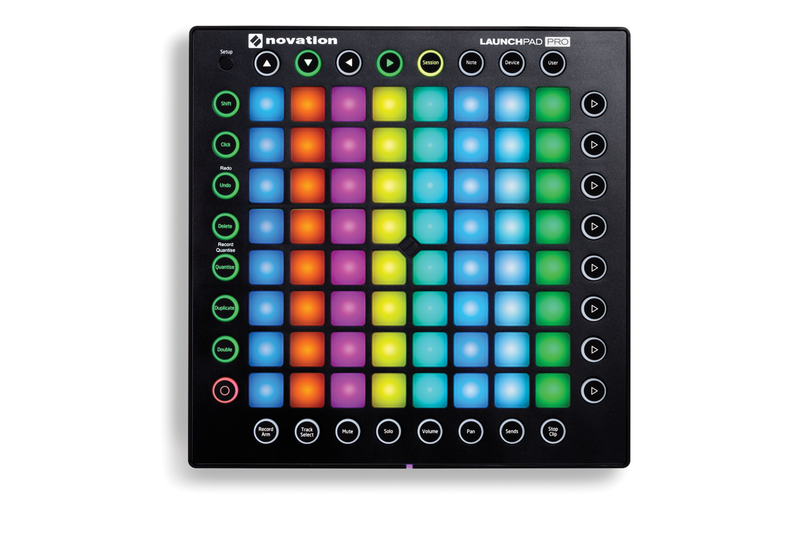 3: RGB pads – These are same size as the pads on the current Launchpad model, but with the benefit of full RGB colours – which means that you’re always getting a clear overview of your Session view clips. 4: Velocity Sensitivity – The pads are also velocity sensitive, which opens up a whole new world of instrument-like interaction, whether you’re playing and programming drums, or using the Launchpad Pro as an expressive grid-based keyboard layout. 5: Edit Buttons – Amongst other things, the left-hand buttons provide editing features, such as Undo (Shift-Undo for Redo), Delete (for notes or clips), Quantise (including Record Quantise), Duplicate and Double. Expect to reduce your mouse time! 6: Record Button – Here at the bottom-left is the Record button; use this in conjunction with the Record Arm button to prepare and record into your audio and MIDI tracks, with clip automation included. Live users are often obsessed with hardware control, which of course drives product design. 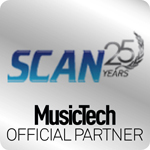 It’s a buyer’s market, spanning everything from niche devices from builders such as Livid Instruments, to iOS apps such as TouchAble and Lemur, and the big hitters such as Akai, with its APC series, and Ableton itself, with Push (see more elsewhere on these pages). 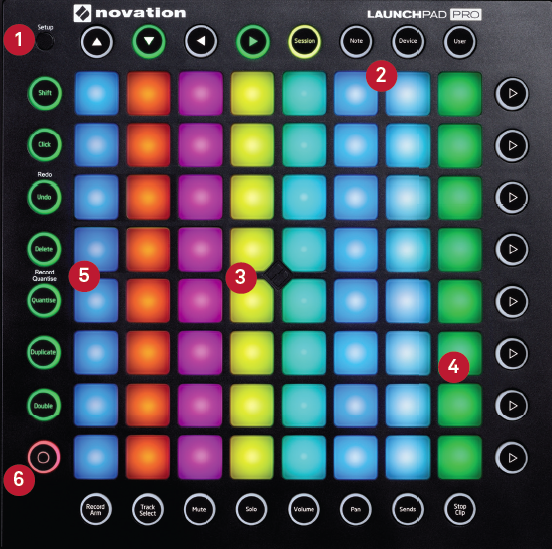 Even sticking to just Novation’s range, there are some alternatives – the Launchkey keyboards now have RGB pads for Live use, there are the Launch Controls, and the Launchpad Mini and S – the latter has recently been updated to include RGB colours for the LEDs. Device mode lets you navigate to a specific device, and take instant control over the top eight parameters (or macros in a rack). Now think about filters or EQs with those velocity-sensitive sweeps going on – excellent! Mixer functions are available across the lower edge of the Pro, with dedicated buttons for record arming, track selection, mute, solo, and so on. There’s also a Stop Clip button, which can be deployed to stop clips in specific tracks or across the entire set. Tap the Sends button, then each ‘fader’ on the Launchpad Pro is a send for each of the current eight tracks. The eight buttons on the right let you select which send you want to use within the tracks – A, B, C, etc; only eight sends are available, though, so if you have between nine and 12 sends in your set it’s too bad. I like to use a lot of sends during performance, and for me this will be a perfect opportunity to use the velocity-sensitive fading again! Editing functions are located on the left; there’s the Shift button, which is used with any control that has an alternate mode, then Click, Undo and Redo, Delete, and Quantise – which toggles record quantisation, as well as quantising recorded audio or MIDI after the event. It quantises audio clips as well – very nice! The Duplicate button duplicates clips or scenes, and the Double button is the same as clicking Dupl. Loop in Live’s Notes box. The Launchpad Pro doesn’t provide ultra-deep programming tools, but it’s intended as more of a performance tool (it says so on the box), and there are more than enough controls for most live situations. The Launchpad Pro is primarily targeted at Ableton Live users, but there are plenty of people who use Live alongside other software, and also – unbelievably – some people who don’t use Live at all! There are times when a dedicated controller is exactly what you need, and times when you want a controller to keep up when you swap between your DAWs. 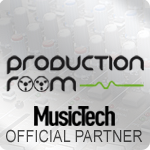 It’s early days, but I wouldn’t be surprised to see the Pro in a more integrated relationship with Logic Pro or Bitwig Studio at some point – all it needs is a little cooperation between Novation and the DAW developers (it’ll be interesting to see how Bitwig Studio integration works out with its Open Controller API). The uses for the original Launchpad far exceeded what was originally conceived for it – and the Pro, with its added functions and enhanced visual feedback, is inevitably going to top that. As you’ll see in this review, I tested it with Logic Pro, and (spoiler alert) of course it does work in a very limited way, but it needs a boost to make it more functional and viable. At this point, realistically, the Launchpad Pro’s all about Ableton Live straight out of the box. The Pro continues the Launchpad tradition of providing a User Mode; if you’re mostly using Ableton Live and the standard devices, you might never need it, but if you’re more experimentally-inclined, User mode is where you can configure the Pro to talk to other software, perhaps Max for Live devices, or to concoct extravagant visual feedback with those new extra-juicy LEDs. It’ll be exciting to see what people come up with! The Setup button reveals settings for velocity and aftertouch response, MIDI routing and channels, and standalone behaviour. A nice touch is that velocity settings, for example, are stored for the selected page, so you can store different velocity curves for drums and notes. 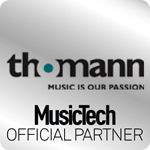 Although the Launchpad Pro is focused on Live control, outward expansion is allowed for. I quit Live and launched Logic Pro X, and the Pro worked perfectly well from the off, using the Setup button to select note and fader modes. Just throw one of Logic Pro’s recently added Arpeggiator presets in front of the Retro Synth, MIDI Learn some filter and delay parameters to the Pro’s faders, and you’ve got instant disco. Music technology has come full circle, as our USB controllers reacquire the MIDI connections that we abandoned not so long ago. Now, the Pro will control your favourite hardware synths or samplers alongside Live, or you can go further, ditch the computer altogether, and work ‘standalone’. I powered up the Pro with the included power supply, and connected it to the Dave Smith Instruments Tetra, a nice little tabletop synth that really benefits from added physical control. In Combo mode, it works as a four-channel sound module, receiving separate MIDI inputs for each, and sending the audio to up to four separate outputs. It’s fast and easy to switch MIDI channels from the Pro’s Setup page, so it was as smooth as could be to play the first sound in a Tetra combo, then change channels and trigger a different sound in the same Combo. Of course, as well as triggering notes and using the Pro’s fader functions, the velocity fader behaviour – which I just can’t stop coming back to – can make for some very impressive sound transformations (you’ll have to re-assign the MIDI CCs on your hardware, though, because the Launchpad CCs are fixed). Leave the slow stuff, such as menu browsing, to your mouse and keyboard, because, frankly, they’re faster anyway. The RGB LEDs make all the difference for Live Session View clip and scene launching, and the MIDI connectivity is going to score with folks using hardware synths and drum machines, while for me it’s the velocity-based fades that nudge it over the edge into ‘must have’ territory. In the studio, it’s not as powerful as Ableton’s Push in the beat and device control departments, but for other situations, the Pro is a flexible, expressive, interface, for your clips, instruments, and just about everything else. 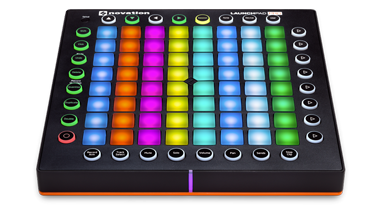 This is a great update all-round, and takes the Launchpad to a new level of Ableton Live control and performance.